Looking strong, mostly because of that iced coffee I’m holding. A written statement declaring publicly the intentions, motives, and views of its female author. May include themes of empowerment, independence, self love, consciousness, affirmation, and individual acceptance; your positive beliefs about yourself. Created to give self-described definition in regards to the innate beauty inside of every woman. Yes, even you. I am a mess of contradictions. I am full of chaos, finding my calm. I am always looking forward to something, and always clinging to something else. I am so good at loving others but not always good at loving myself. These contradictions make me who I am: a whole, complicated, messy woman. I am a woman and beautiful. I will be my most authentic self. I will never stop creating. I will remember how lucky I am to be who and where I am. I will love my body in any shape it takes. And I will forgive myself when I forget to do these things. It is my right to share any or all of myself without fearing what people will think. It is my right to walk alone, on any street, without fear. It is my right to be healthy, in all ways. It is my right to see the good in everyone and not have that trust violated. It is my right to laugh too loudly. It is my right to be raunchy and dirty and unapologetic. It is my right to make a scene. No longer will I worry about what I “should” be doing at my age, whatever age that may be. No longer will I worry about what I “should” look like. No longer will I direct anger or negativity at my body. No longer will I feel guilty for being frivolous. No longer will I feel guilty for being serious. No longer will I feel guilty for having a biological clock. No longer will I censor myself. I embrace the windingness of my path. I embrace the curves in my body. I embrace my many moods. I embrace the passion and chaos that makes me who I am. Phew! I enjoyed that. Now it’s your turn. All Those Things At Once. More to come soon. 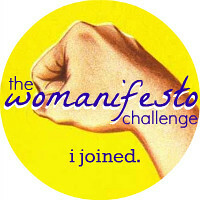 In the meantime – what’s your (wo)manifesto?